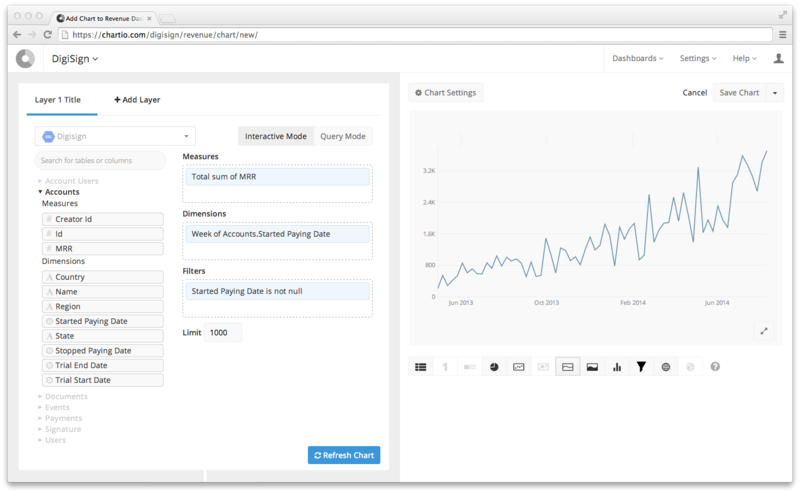 Chartio, a business intelligence service that lets you explore your data from a wide variety of sources, is launching a new service today that should make getting started with data analysis and visualization quite a bit easier. The new Data Pipeline, which Chartio co-founder and CTO Dave Fowler described to me as “a bit like Yahoo pipes but for business data,” takes your data and walks you through a series of steps to transform and merge it. It doesn’t quite have the graphical interface of Yahoo Pipes, but in return the new interface allows you to more easily perform all kinds of standard operations on your data (think merges and sorts). Many of those features for working with data in Chartio have long been part of the company’s toolbox, but others, like ordering and limits with offsets are new in the release. As you walk through each step, you can always see a sample of your data to make sure everything is working as expected. You could do something similar on previous iterations of Chartio’s tools, but those pipelines could grow long and unwieldy. The new tool breaks all the steps into more manageable chunks and always displays the current state of your chart or table on the right-hand column. Current Chartio customers include the likes of Lyft, Indiegogo, Optimizely, Rackspace and Apartment List. The Data Pipeline is rolling out to all current customers tomorrow and will be the main way to explore data in the service. As services get better at ingesting large amounts of data, their focus is going to shift away from just making that data accessible and manipulating it to making it easy to handle. Microsoft, for example, has Power BI for Office 365, which is also moving down this path of making data exploration accessible. It’s approach is different from Chartio’s (and it has quite a few more features), but the end goal for most BI tools remains the same: giving all employees access to the right data at the right time.